Nicknamed "AJ", Mihalic grew up on the New Jersey shore and played volleyball during summers at Belmar Beach starting in high school. While attending the New Jersey Institute of Technology, he studied mechanical engineering and literature, and as a freshman he walked on to the volleyball team. By his senior season he was voted team captain three times and a Small-Schools All-American. 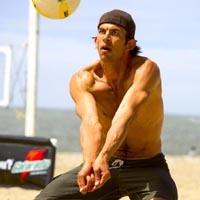 In 2001 Mihalic moved to Hermosa Beach, Calif. to pursue a career in beach volleyball. On the AVP tour, Mihalic has two career-best 9th place finishes, both in 2005, in the Santa Barbara Open and the Manhattan Beach Open. Mihalic stopped playing full-time in 2009 to start a family and pursue a career in search marketing. Along with fellow volleyball players Billy Allen and Dan Madden, Mihalic founded the popular volleyball commentary site kindagood.com in 2003. Mihalic has worked as an engineer, web developer, and in digital marketing. He currently specializes in SEO in New York City. He and his wife Aimee have three children, Gwyneth, Sonny, and Jude.